These are very rarely called Great Lead-Winged Coachmen. Sporadic hatches are rarely as outstanding as those of Isonychia. 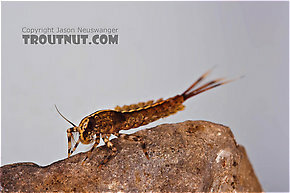 On streams with good populations, they are reliably hatching in light numbers, here and there, for most of the evening through most of the mid- to late season. 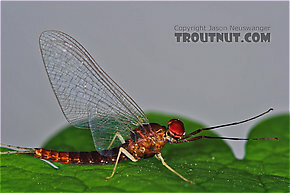 The spinners, and occasionally the duns, produce more concentrated action, but the real value of the Isonychia hatch is its duration and the size of the flies; large trout become ever watchful for them, even when they aren't emerging. All the species of Isonychia are similar in appearance and behavior. 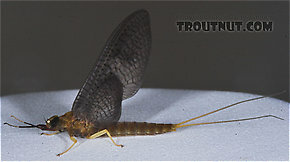 Male Isonychia bicolor (Mahogany Dun) Mayfly Spinner View 15 PicturesI got several really nice pictures of this spinner. I also collected a female on the same trip.